Trapped within a star cruiser, surrounded by hostile creatures, can you and your squad escape the Carnage alive? Derelict is a tactical First Person Shooter with a Sci-Fi survival horror theme. 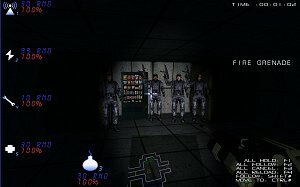 The player must successfully guide his squad of Space marines though a series of increasingly dangerous levels. Each Marine in the squad has unique skills needed to survive: 1. Communications - Equipped with Radar 2. Heavy Assault - Armed with a Heavy Machine Gun 3. Demolition - Can Blast doors and heavy objects 4. Engineer - Able to repair doors 5. Medic - Can heal your team.